That explains so much. So very much. [I]t is not quite true that Trump lacks a personal faith tradition. He was baptized and confirmed at a Presbyterian church in the Queens neighborhood where he grew up. Later, his parents joined Marble Collegiate Church in Manhattan. The pastor there was Norman Vincent Peale, and it’s the church Trump came to call his own. Peale was in fact one of the most famous Christian preachers of the 20th century, well known for his admiration of successful businessmen. He regularly sprinkled his sermons with anecdotes about prominent industrialists he had known and respected, from the president of the Ralston Purina Company to the founder of Kraft Foods. Trump’s exposure to ‘Christianty’ came through the mire of heresy. Read the whole. The Supreme Court Shocks Us All And Recognizes That Gender Is a Real Thing! The U.S. Supreme Court is temporarily blocking a transgender male high school student in Virginia from using the boy’s bathroom. We’ve reported on the case of Gavin Grimm in the past. If you remember, Grimm scored a big victory when the 4th U.S. Circuit Court of Appeals ruled that his school in Gloucester County, Va., should have followed the federal government’s interpretation of Title IX, which calls for schools to treat “transgender students consistent with their gender identity.” A lower court issued an injunction that put the school’s policy on hold and would have allowed Grimm to use the boy’s bathroom. Lawyers for the Gloucester County School Board asked the Supreme Court to put that injunction on hold while they filed an appeal with the high court. Yesterday, the court ruled 5-3 in favor of doing so, though Justice Stephen Breyer made it clear that he was joining the majority only “as a courtesy.” Joshua Block, an ACLU attorney who has been working on the Grimm case, said he was disappointed by the ruling. The ACLU… Fighting for genderlessness since 1970. Over the years he’s been proven right more times than I can count. This! Those Reformation historians/theologians are my favorite people. 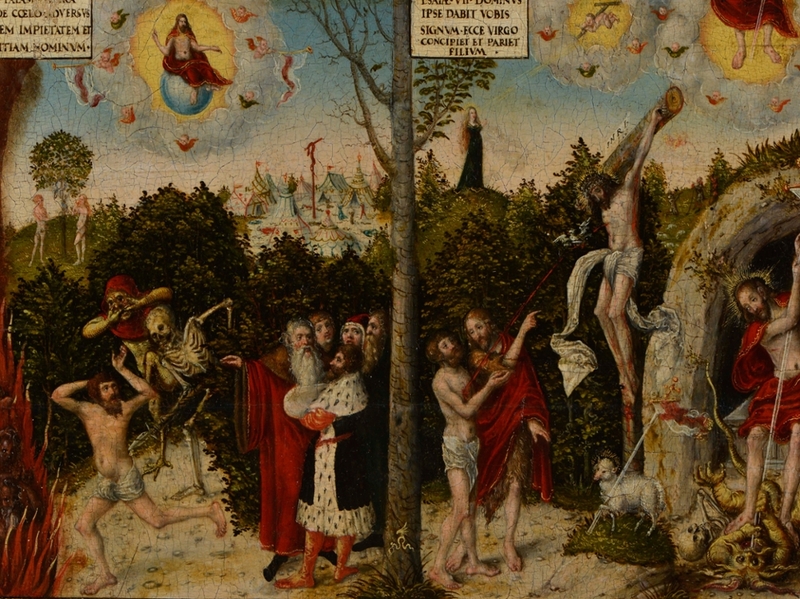 Image: “Law and Grace.” Lucas Cranach the Younger (Ca. 1550). Luther Memorials Foundation of Saxony-Anhalt. Permanent loan from the State of Saxony-Anhalt. I’ll see you there (if you go in early October, because I’m going the week it opens). The Implementation of the Lord’s Supper / Huldrych Zwingli ; translation and introduction by Jim West. (Occasional publications of the Pitts Theology Library; Atlanta: Pitts Theology Library, 2016). 14 pages; 23 cm. It is accessible online (http://pitts.emory.edu/zwingli), and we invite libraries to add this as an electronic resource to their catalogs. Huldrych Zwingli’s Actio[n] oder Brauch des Nachtmals, Gedechtnus, oder Dancksagung Christi … (1525) was acquired for the Kessler Reformation Collection in 2010 to document the vigorous debate between Luther and Zwingli about the Lord’s Supper, one of the most divisive issues among Protestants in the third decade of the sixteenth century. We are delighted that Dr. Jim West, widely known for his interest in Zwingli, graciously undertook the task of translating and writing a brief introduction to the work, and we are grateful to Dr. and Mrs. Walker L. Ray’s subvention of the project in honor of Susan Snow Hope. In addition, Pitts Theology Library volunteers and staff have assembled and stitched print copies, as a book arts exercise, and these are available at no charge to libraries or scholars requesting them at http://pitts.emory.edu/publications . No really. Then at least we wouldn’t have to endure this kind of inhumanity. An Arizona mother has been arrested and charged with murder after she reportedly gave methamphetamine to her nearly 2-year-old daughter. Phoenix police report that on April 13, Natalie Renne Russell, 30, left a 120-milligram bottle of liquid methadone within reach of her children. They say that her nearly 2-year-old daughter Adalynn was found by her mother unresponsive and not breathing. The bottle of methadone was nearby and empty. Police report that instead of seeking medical attention, Russell did internet searches for information about methadone. A witness reportedly told police that Russell told them that she was going to give to her daughter some methamphetamine to counter the effects of the methadone. This witness says they saw Russell give the child the methamphetamine. The girl was pronounced dead the next day by the Phoenix Fire Department. The Maricopa County Medical Examiner’s Office says the autopsy showed that the child was found to have “toxic levels of methadone and methamphetamine in her body.” Russell was arrested at a home in Gilbert near Gilbert and Baseline roads on July 26. She has been charged with first-degree murder and two counts of child abuse. Ιησους. Make it stop. This is injurious to the soul. Zondervan announced Thursday an exciting new wide-margin journaling edition of its popular NIV Bible translation which eliminates the biblical text altogether to provide readers with more space to write their own thoughts, ideas, and feelings as they study God’s Word. It’s great for Pentecostals too! This email advert came today. The ‘coupon code’… what the devil! I live in a poor country and can’t afford bible software like Logos or Accordance or BibleWorks. Is there free Bible software that you would recommend? Thank you for your time, and your blog too (I’m a regular reader). Thanks for being regular! 😉 And yes, there is free Bible software that I can recommend. It’s called S.T.E.P. Scripture Tools for Every Person, and it’s by Tyndale House, Cambridge. You can learn all about it here. Those who have worked on the project are listed here– and it’s quite an international assembly (and you may recognize a name or two). Finally, if you don’t want to use the tools online or have limited access, you can also download the module here and you can then use it offline. Forget all those kitten pictures and puppy videos- here’s something that will cheer you up! Freitag, 07. Oktober 2016 11:15 – Samstag, 08. 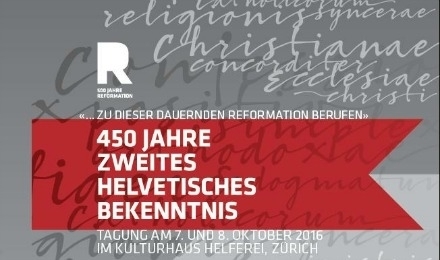 Oktober 2016 15:15: 450 Jahre zweites helvetisches Bekenntnis, Tagung im Kulturhaus Helferei, Zürich. Das «Bekenntnis und einfache Erläuterung des orthodoxen Glaubens und der katholischen Lehren der reinen christlichen Religion», kurz Confessio Helvetica posterior/Zweites Helvetisches Bekenntnis, von Heinrich Bullinger 1561 verfasst und 1566 gedruckt, gilt als repräsentative Zusammenfassung der schweizerischen Reformation. Es gewann dann Bedeutung auch weit über die Eidgenossenschaft hinaus und trug massgeblich zur Festigung der Lehre und Bekenntnisbildung des reformierten Protestantismus bei. Als internationaler Exportschlager war das Zweite Helvetische Bekenntnis immer wieder Anlas für theologische und kirchliche Auseinandersetzungen. An der Tagung zum 450-jährigen Jubiläum referieren und diskutieren namhafte Expertinnen und Experten aus historischer und systematisch-theologischer Sicht über Geschichte und Aktualität des Zweiten Helvetischen Bekenntnisses. Die Veranstaltung richtet sich sowohl an Studierende, Pfarrpersonen und kirchliche Fachleute als auch an ein theologisch und historisch interessiertes Publikum. Die Tagung kann als Studienleistung anerkannt werden. Anmeldung bis 30. August 2016.